Just as modern medicine helps keep us healthier and live longer; today’s auto industry now produces vehicles that can last 300-400,000 miles or more if properly maintained. To help customers get the most life out of their vehicles, Sallas Auto hosts car clinics that educate drivers to about their cars, and the safety importance and cost savings associated with preventive maintenance. We began our car clinics 13 years ago after identifying a need for drivers to understand their cars. Originally the clinics started as a women-focused clinic. We recognized that too many women were being taken advantage of at auto repair shops. We began our clinics as a way to educate customers about proper car maintenance so that women and men alike would not be taken advantage of when it came to regular and preventative maintenance. At a car car clinic, participants hear a presentation from Nick Sallas about car maintenance. Nick explains how to make your vehicle last longer, protect your resale value, how to buy your next vehicle, check the air pressure, oil levels, and car fluids. The class also teaches what each gauge means, as well as what all of the lights on the dashboard indicate. After the presentation, our certified technicians work with each participant and go over their personal vehicles from front to back. Each participant walks away with a thorough understanding about their car, and how to keep it in the best running condition. Everyone is welcome ~ you do not have to be an existing customer to attend. Clinics can also be helpful for new drivers, as we teach them about their car and how to properly maintain the vehicle. Car care clinics are great for men and women who desire a better understanding about caring for a vehicle. As clinic participants put the information they learn into practice, they find that they actually save much more money in the end. Rather than performing expensive repairs, those who maintain their cars end up spending at least half as much preventing costly repairs. For example, the class teaches about transmission fluids, and the need to flush out the transmission every 3o,000 miles – which costs around $160. Customers who don’t do this preventative step could end up having to replace a transmission, costing around $2,500. Car care clinics can help prolong the life of your car. 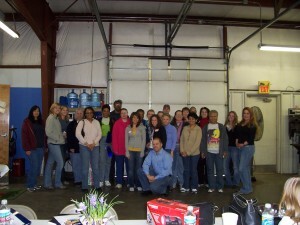 The next car care clinic will be at the Overland Park shop, on Saturday, May 7, 2011. All are welcome to attend, please RSVP to Sallas Auto. 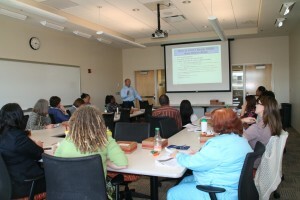 A shorter version of the car care clinic, a Lunch and Learn, is also available for groups. It’s a condensed, hour-long version of our car care clinic without the hands-in vehicle inspection.Contact Nick Sallas to inquire about our Lunch and Learns.